I am an aid worker. Like many of my colleagues, I often feel inadequate, unfulfilled as I don’t “do enough”. Enough to make a difference. Enough to make a real change in the world. And yet, I do believe that the world can be made a better place. While I strongly believe change is a social movement, creating a social conscience, I am also convinced the change starts from within. Within each individual. I want to start with me. And those around me: my friends, my colleagues, my family and those of you who read “The Road to the Horizon” regularly. This is one of the reasons I started this blog, The Road. Not only to share my experiences, but also to make people aware of social issues. And to make people aware of “the work in progress”, the work to “make this world a better place”. But talk is not enough. Now is the time to start doing something. And what better time than now, at the start of the “Season of Giving”. Would we not want to do away with the unwanted presents this year, and use that money for a good cause? 1/ “Change” starts within the individual, both in those that give and those being assisted. I want to concentrate the assistance on the individual, not on an organisation or institution. 2/ I truly believe in the power of micro-financing, a “poverty relief mechanism” which came into the spotlight when Bangladeshi economist Professor Muhammad Yunus won the Nobel Peace Prize in 2006 for his micro-credit pioneer work. 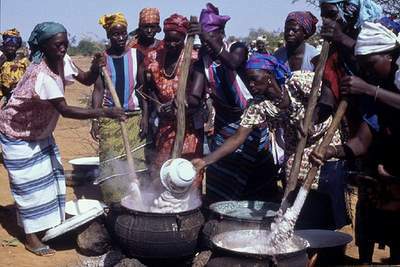 4/ Thus, combining the above, I want to “invest” money, on a strictly not-for-profit basis, in individual initiatives by women in the developing world, through a controlled micro financing scheme. 5/ I am intrigued by the work of Kiva, a not-for-profit organisation, the world’s first person-to-person micro-lending organisation. Through their website, Kiva enables individuals to lend directly to unique entrepreneurs in the developing world. Anyone can look up a person in the developing world who needs some start-up or investment funds (screened by local micro-financing organisations), and give them an interest-free loan. Once the loan is paid back, the lender can redraw his/her money, or re-invest it in another individual. There is no overhead, all funds go directly to the person requesting for the loan. 1/ I have set up a lending team on Kiva, through which I will encourage people to contribute to several projects. You can track the loans here. 2/ To kick things off, I made a loan of US$100 (80 Euro) to “Danaya”, a group of seven women in the Hamdallaye district in the city of Koutiala, Mali. (check this post for details). 3/ With a group of colleagues, we will arrange for a series of small local social events in which each of us, in turn, will cook a dinner. Each participant will pay 20 Euros (about US$25), which we will invest through The Road’s lending team in some of Kiva’s selected micro-businesses set up by women. Update Nov 4th: Collected US$150 on the first one! Check this post. 4/ From November 1 until December 31 2008, I contributed US$1 for every comment left on the original kick-off blog post. 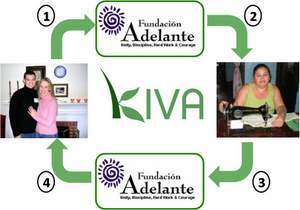 Each dollar was invested as a loan in a Kiva project through The Road’s lending team. Update: US$67 was collected by Dec 31. 5/ I will actively make publicity for this project on “The Road to The Horizon” and regularly report on its status. You can follow the progress of our project via our score card. 6/ You can also contribute through my PayPal account (to get the details send me an email via peter (a) theroadtothehorizon (dot) org), or register with Kiva, and contribute directly. Attribute your donation to the lending team “The Road”. Drop me an Email when you contribute, so I can track the total donations. Be the change you want to see, starting now! I think this is such a nice and easy gesture to get people involved in something so meaningful. These are such elementary steps to take to change someones life. Thank you for starting this and helping such desparate people. You plan is very great. I wish you best of luck for working on this plan. You are creating an example for rest of the world to follow. RSS subscriptions What is RSS? Horn of Africa: Want to have impact? Help us spreading the message! Tamber: Alright alright alright that\'s eacxlty what I needed! Peter. Flemish, European, aid worker, blogger, expeditioner, sailor, traveller, husband, father, friend, nutcase. Not necessarily in that order. This blog is licensed under a Creative Commons Attribution-Noncommercial- No Derivative Works 3.0 License: You can re-use any material for non-commercial purposes as long as you link back to this blog. Copyright © 2012 Have Impact ! - You can reuse this content for non-commercial purposes as long as you link back.